With a samll sharp knife, incise an X through the outside shell of each chestnut. Put chestnuts in a shallow baking pan and place in oven for 10 minutes. Remove from heat. When cool enough to handle, remove outer shell and peel off the inside skin. The peeling process becomes more difficult as the chestnuts cool, so it may be necessary to reheat some of them. There will be approximately 3 cups. Canned or frozen chestnuts may be substituted. Heat 2 tablespoons of the oil in a large skillet over high heat and sauté half of the cubed meat. When the meat is lightly browned, add half of the onions, and continue cooking several minutes. Transfer the meat and onions to a baking pan and cool. Repeat with the remaining meat and onions. Mix in the thoroughly cleaned (drained, if using canned or frozen) chestnuts. Place the stuffing in a buttered ovenproof casserole, or loaf pan and cover with foil. Set the casserole into a small roasting pan two-thirds filled with water. Bring to a boil and transfer to the preheated oven. Bake for 1 - 2 hours, reducing the temperature if the water boils rapidly. The internal temperature of the stuffing should reach 160 degrees on a meat thermometer. Remove from the oven. To Prepare the Goose Breasts: Coat the breasts with oil and season with salt and freshly ground pepper. On a hot grill, place the breasts skin side down. Depending on the size of the goose breasts, for medium rare, grill for two to three minutes, turn the breasts and cook for another two to three minutes. Remove from the grill and allow to rest for five minutes. To Serve: Warm serving plates in a 200 degree oven. Slice goose breasts on the diagonal and place slices on each warmed plate. 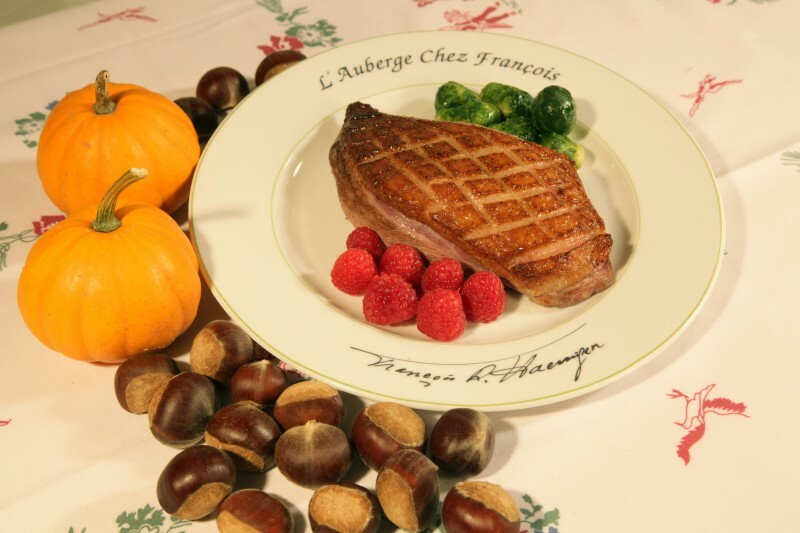 Serve with the chestnut stuffing and your favorite fall garden vegetable. Hint: Shorten or lengthen cooking times based on size of breasts and individual tastes. Wild goose breasts are best served rare to medium rare. Breasts will toughen if overcooked. Stuffing can be made a day ahead and then reheated before serving. 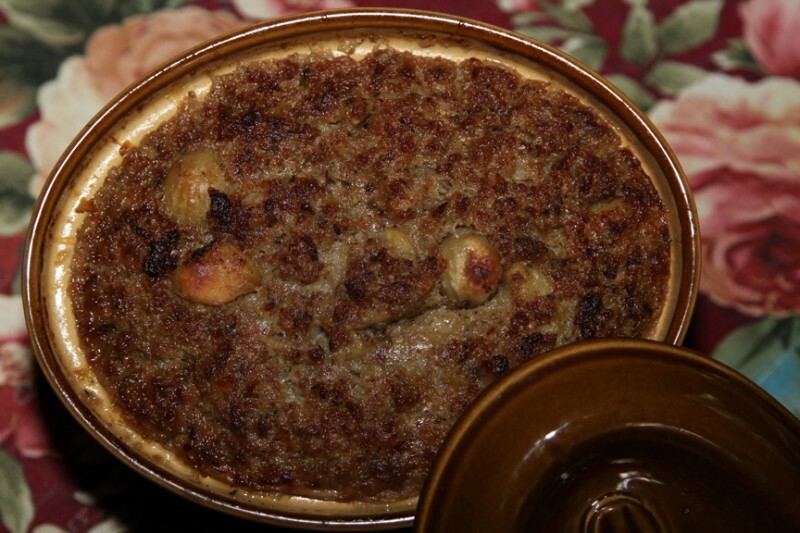 Chestnut stuffing is excellent with Thanksgiving turkey.